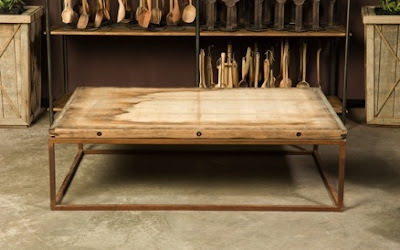 Pure Style Home: Velvet & Linen's Brickmaker Table!! Velvet & Linen's Brickmaker Table!! Don't forget to head over to Velvet & Linen to vote for who you think should win the INSANELY BEAUTIFUL Brickmaker's Table!!! There are 10 finalists & they're all so different it's almost impossible to pick just one!!! I wanted this thing BADLY but don't have enough space for it... one day... This was seriously the best giveway I've ever heard of!! Hi Lauren...first time visiting your blog...coming from Cote de Texas. I think your beautiful stenciled wall would make an amazing back drop for the Leonardo Da Vinci sketches. I vote your hubby for Best Hubby of the Year Award! Love his determination to see the project through to the end!